A Brand New Family of 3! So, I am going to do it! The best way to get me your email address is to message me on facebook! I also made my comments private if you want to leave it in here. Thanks everyone! Jaycee is 9 months old!! My little girl is growing up so fast! I can't believe it! Her personality is really shining through and what a happy, easy going but busy girl we have! I wish she was a bit more of a cuddler, but oh well! Her biggest acheivement this last month is she is standing on her own! She has stood for up to 2 min! What a big girl! She also loves to "help" mom with all the chores! Notice the quotation marks! I am so glad that she wants to be with me and try to do what I am doing but it can be challenging to get anything done! So, I haven't had a chance to put up older pics, but I will finally give ya some this month! Enjoy the pics of our little cutie!! Feeling Not Quite Up To Par! So I have been sick for the last week and my house shows it! The dishes havn't been done, laundry has gotten as far as sorting, and we went on a trip last week to Junction for a funeral and the stuff still isn't put away! I am stressed about money(but who isn't), and today it all just came to a head! Part of it is that I didn't get much sleep last night cause Tom and Jaycee were both sick, and then I didn't think it was a good idea to take Jaycee to church today because she wasn't feeling well and it was cold and the wind was terrible and it was raining, and I am having a hard time sleeping tonight, and I am stressed that my house looks like it does and I was just feeling sorry for myself...still am if you want to know the truth, but I am doing better! My cousin helped me feel like I am a good person and I do try to look out for others. This is stuff I needed to hear tonight. Not to toot my own horn, but so that I felt a little human again, instead of a lump. I have set a goal to read the Book of Mormon in 90 days! There is a great website called readthescriptures.com that is helping me with my goal. Today I was doing extra reading cause I couldn't go to church and I was a little bit behind! I sure love the scripture and I love how at different times in your life they can say different things to you! I am so grateful for what they said to me today! It gave me strength and courage to go on, realizing that if I keep trying, the Lord will reward me in the end, which reward is greater than any monitary thing I could have right now! I still was having a hard time pulling myself out of my slump though and I was reading people's blogs, which isn't always condusive to feeling better about yourself because it always seems that everyone is doing so well and that they have nothing but a blissful life! I was reading what my friend Jayna wrote,(who I have not seen for FAR TOO LONG!) and it helped me to remember that everyone is human! Then I just couldn't let my dishes go any longer and at 1am I started doing them! It was nice and almost therapeutic to do them alone! Not saying I love doing dishes but I needed some me time! There is a sign over my sink that is a picture of Christ and says, "I never said it would be easy, I only said it would be worth it!" I gained a whole new appreciation for this tonight! Somebody in my Relief Society class said once that that saying was false because the Gospel makes things easy, and I have always felt kinda bad cause I thought I was not a good member of the church because things were still hard even though I was living the gospel! This added to my depressed state because I really do want to take upon myself the name of Christ and be a good member of the church and daughter of God! Tonight I realized though, that maybe that is how it is for that person, that is not how my life was laid out! The Gospel of Jesus Christ can make things more bearable, there is no doubt about that! I am hear to tell you though that I have been diligent about reading my scriptures and better about saying my prayers and more faithful about going to church, even if I have to go alone cause poor Tom has to work, and faithful about paying a full tithe and things are still not easy! I don't say any of that to make you think I think I am better than anyone, I am just telling people that I am feeling pretty good about the things I am doing to become closer to my Savior and life is still hard! But I cannot deny that I am happy! I have been born of goodly parents and my relationship with my family is as good as ever! I have come to realize how much my parents sacrificed for me so that I coul have thing and be taught correct principles. Even if it was just fighting us to get up for scripture study, or making sure that we knew what Christmas was really all about! The little things! I have the best inlaws and we get along so well! I am married to the most amazing man I know and on top of that am still madly in love with him after almost 4 years of marriage! In this day and age that is saying something!! I plan on being even more madly in love as the years go by for the rest of my life and throughout eternity! I have the blessing of the sealing power in my home and a worthy priesthood holder at my side as my constant companion and best friend! My heart has been completely stolen by a little 8 1/2 month old who is asleep in her room right now that I just want to go hold and hug and kiss and tell her how much I love her. It's funny cause earlier I was frustrated that she was being a huge Mama's girl, and now I would give anything to just cuddle her!! Why do I have to get so frustrated about those things and why don't I take advantage of them! She is a pretty independent little thing and the cuddle time I have is limited! I have AMAZING friends, some who I talk to every day, and some who I wish I kept in better contact with who are all very dear to my heart! I know this life, even though not easy is so worth it! All the joy I feel is what keeps me going! I may have my down days, but I know that I will have those times that bring me up again! I knew this would make me feel better! This hymn has just come to mind! Count you many blessing; name them one by one. This song embodies this post and what I was feeling at the beginning of typing to what I am feeling now! 7 months and on the move! Jaycee's favorite thing this month is to pull herself up to everything and she started walking along the couch! She is still unsure of herself, but she is a little daredevil, so I expect her to try things as early as possible!! The same day she started walking along the couch she said "Dada" for the first time and then almost a week later actually said "Mama" like she was talking to me not like she was going mamamamamamamamama just to hear the sound of her voice! We had to put a big dinosaur toy in front of the dvd player and stuff in the living room and she is learning the meaning of no! I am so glad she's such a good girl and catches on fast cause disipline is not my favorite aspect of parenting, but I am firm with her and she really does know what no means! Just before her 8 month mark, she started standing on her own! Only for a couple of seconds, but she is not afraid to try new things! She is becoming more independent and can play in the living room for about 2 min while I am in the kitchen before coming to find me! She is my little buddy! Our Jaycee Boo is 6 Whole Months!! She is growing so much! ~She loves it when Mommy sings Primary songs, Itsy-Bitsy Spider and finally Patty Cake! ~She had meat for the first time and actually liked it! ~She started waving her arms around all over the place and inspecting her hands! It's so cute to watch her learn what she can do with this newly acquired human body! ~She reached for me the first time and I of course was in tears I was so excited! ~She got her first tooth! FINALLY! ~Because of this, she is not sleeping through the night like she had been! ~She learned to pull herself up to the furniture and she thinks she's so big!! I can't believe she has been in our lives for a whole six months! It's incredible to me that we ever even lived without her! I am so grateful she is mine for eternity!! 5 months and a lot of firsts! ~Her first fourth of July was pretty uneventful! Daddy had to work and she slept right through the fireworks we did get to see! ~Jaycee went on her first camping trip! It was at Timid Springs up Beaver Mountain for the Ipson family reunion. ~Jaycee got to go to her first funeral! Her Grandpa Great Henrie passed away after having a stroke 4 days earlier while we were at the Ipson reunion. ~While we were in Las Vegas, she sat alone and grabbed Mama's face and gave her a kiss, without me asking for one! SOOOOOO CUTE! And at this emotional time it was so healing! ~First time being away from Daddy for more than just a day while he was at work! After my grandpa had his stroke, Tom had to go back to work, but I really felt like I wanted to be with my family when he passed away! I am so glad I was! What a spiritual experience! Jaycee had to stay with Mama and Daddy was not happy about this! Mama and Daddy both cried as Daddy pulled away and for a lot of the rest of the week! Mama missed Daddy terribly and wanted the comfort that only he could give at this very emotional time! Also she felt so bad that Daddy wasn't there to see his "Boo" everyday! Daddy cried cause he missed us and didn't want us to have to go through this alone! The reunion at Buckhorn was very sweet! ~She had eaten her first food last month, but this month she was learning all about more vegetables, and then started learning about fruit! She is very good at eating her veggies still even though she has tried the sweet! ~She went to the ER for the first time! She had a cough for about a week but one night when she was eating her food, she was gasping for air. It scared Tom and I really bad! We got to the ER and she didn't cough once, which frustrated me at first, but then I remembered Tom had given her a Priesthood blessing before we left the house and it made her all better! Boy are we grateful for the Priesthood and a Daddy who is worthy to give us blessings!! ~We went to the Henrie reunion for the first time at the Johnson Oak Ranch! It was a blast! We were so grateful to be together as a family, but we were sure missing our Grandpa!! Jaycee got to go on her first 4 wheeler ride! ~The day before she turned 6 months old she started crawling in the mother's room at church! ~She is still exploring her voice! Well, I am a little bummed, cause I was going to sit down and do a post about every month, which I still intend to do, but I wanted to put pics with each, but the only way to get a pic on this computer is to copy it from Facebook, which it is not letting me do right now, so I will have to come back and post the pics later, but I have waited far too long for this to make me quit! Yes I had to get out her baby calendar to remember all this stuff! Jaycee is getting bigger everyday! She is growing and changing so much! She is loving to watch the colors on TV and she is grabbing objects! She grabbed her toy keys before she was 2 months old, but is now grabbing all sorts of things! Mommy finally got her first smile on camera! It is adorable! Jaycee is now sleeping in her own room in her big girl crib! We took her to the park for the first time and she took to grass quite a bit better than I did when I was that age! She is holding her bottle on her own now, which freaks mommy out a bit cause she is just getting too big!! The big news for this month is that she rolled over on her own! She is getting so big and strong! I love my little girl so much! A Mommy milestone this month was that I celebrated my first Mother's Day as a mother! It was awesome! Tom and Jaycee got me a stroller that I have been wanting and Tom got me a bracelet and some earings! We got to spend the night before at Nana Hughes' and go to church with her! It was definitely a day of contemplation! I couldn't believe how incredibly blessed I was! Tom and Jaycee are my whole world and I couldn't be happier!! Tom and Natalie met in March 2006 through a friend! We talked on the phone most of the next weekend and never spent another day apart. 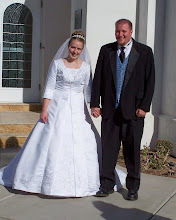 We were married for Time and All Eternity January 6, 2007 in the St. George Temple. We live in Salt Lake City where Tom is working as a manager at Auto Zone and looking for an Electrician Apprentice Job so he can return to school to be an Electrician. Natalie is working as an RN at the new Intermountain Medical Center. We are excited to announce that we are the proud parents of a beautiful little girl that we named Jaycee! She was born February 9, 2010 and is such a blessing in our lives! Her daddy and I are absolutely in love! All in all, our world is crazy buzy, but we are loving living each and every day to the fullest!